Médard Chouart Des Groseilliers , a native of Champagne, was baptized on July 31, 1618 at Charly-sur-Marne. Except for having spent some time in Touraine, nothing is known of his life before his arrival in New France in 1641. Taken into the service of the Jesuits as a servant, a donné or an interpreter, Des Groseillers travelled with them until 1646. He was the first Frenchman in New France to recognize the possibilities for fur trade around Hudson’s Bay. Despite being the person responsible for identifying the primary economic resource that could save the colony, history dismisses his as a mere adventurer trying to make money for himself. After leaving the Jesuits, Des Groseilliers learns the Algonquin, Huron and Iroquois languages. He settles in Québec and marries Hélène Martin, the daughter of Abraham Martin, on September 3, 1647. One of their two children, Médard, will follow in his father’s footsteps. Widowed, Des Groseilliers marries Marguerite Hayet in 1653. She is the half-sister of Pierre-Esprit Radisson, who was 13 or 14 at the time. 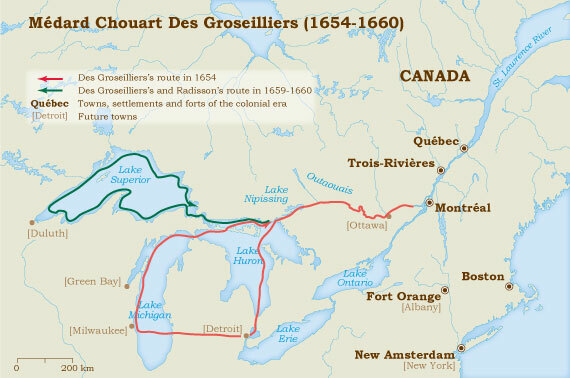 Des Groseilliers leaves Québec for the settlement at Trois-Rivières where many of the colony’s traders can be found. In 1652 and 1653, murderous incursions by the Iroquois against the French living in the Saint Lawrence Valley as well as against their allies, the Great Lake Hurons, make life difficult. They are cut off from the market for their furs. On either side of the Atlantic, there is talk of abandoning the colony if nothing is done to protect the fur trade. In the spring of 1663, some Hurons show up at Trois-Rivières and reveal the existence of a cache of furs not far from the area the French call the North Bay or North Sea (Hudson’s Bay). Upon hearing this bit of good news, Des Groseilliers makes his appearance. In the months that follow, he goes to Acadia and then to Boston, trying to get financing for a trip to the North Sea by way of the Atlantic Ocean. His plans fall through. However, in early summer, 1654, the colony is ecstatic: the furs promised by Hurons a year earlier, arrive in Montréal carried by hundred or so Amerindians in canoes. When the Hurons head back to the southern and western areas of Hudson’s Bay on August 6, Des Groseilliers and another coureur de bois go with them. They start their journey on the Ottawa River near Lake Nipissing and from there, down the French River toward Georgian Bay and Lake Huron as far as the strait which links Lake Erie to Lake Michigan. According to historian Grace Lee Nute, even though Pierre-Esprit Radisson later gave a detailed description of this trip, he was elsewhere at the time. When they return to the colony near the end of August 1656, Des Groseilliers and his companion are part of a flotilla of 50 canoes laden with valuable furs. The years that followed were uneventful. In Trois Rivières, Des Groseilliers divides his time between short trips to carry out trade and meeting his responsibilities as head of a family. Despite the opposition of the Governor, Pierre Voyer d’Argenson, he leaves again in August 1658 or 1659. This time, his brother-in-law is part of the expedition which takes them west of Lake Superior. When they return in mid-August 1660, they are leading a convoy of canoes carrying 300 men and many furs. They were the first Frenchmen to see the Mississippi, although they did not realize the importance of that find and they did not reach the North Bay although the Cree had described it to them in great detail. The Journal des Jésuites on August 24 states that of the 100 canoes which left Lake Superior,”40 turned back and 60 made it through, loaded with 200 000 livres worth of pelts; they left 50 000 livres worth in Montréal and carried the remainder to Trois-Rivières. ” When they arrive at Québec, they are”saluted by the cannon and batteries of Fort Saint-Louis and those of three ships anchored in the harbour.” After formally acknowledging Des Groseilliers contribution to the colony’s prosperity, the Governor has him imprisoned for having left without permission. They are fined heavily and their goods are seized. Des Groseilliers et Radisson told no one what they knew about the Northern Bay:” We wanted to find their land (that of the Cree) and see it for ourselves before telling others about it. “They way they are treated by the Governor, who had again refused them permission to leave, greatly offends Des Groseilliers. In 1661, he can be found in France. Despite many promises made by the Minister for the Colonies in a meeting with Des Groseillers, nothing ever comes of it. In La Rochelle, an associate supplies him with a sailing ship to take him to the Northern Bay from Percé. However, after this plan falls through, Des Groseilliers heads for Boston, becomes involved with some local shipowners and attempts more fruitless journeys to the bay. Near the end of the summer of 1665, Des Groseilliers and Radisson are in London where they will meet the king of England and tell him everything they know about the treasures to be found around Hudson’s Bay. Three years later, they will guide the first two English ships to head there. Radisson’s ship is damaged in a storm but not the one carrying Des Groseilliers, the Nonsuch, which passes through Hudson’s Strait, past Cape Diggs (Wolfenbuttel) and enters Hudson’s Bay. After crossing this inland sea, heading south, the ships reaches the Nemiscau (Rupert) River on September 29, 1668. During the winter, Chouart’s companions lay the foundation of Fort Charles. Four years later, Des Groseilliers stops cooperating with the English as does Radisson. However, his return under the lily doesn’t last long. In 1682, the renegades lead two ships of the Compagnie française de la baie d’Hudson as far as what is now known as the Hayes River. In 1684, while Radisson returned to England to live, Des Groseilliers was chose to end his career in the colony. He died between 1695 and 1698, perhaps in New France, somewhere around Sorel.